Like many of my co-workers here at The Escapist, I've been playing the absolute crap out of Star Wars: The Old Republic. The gameplay's fun, the combat intuitive, and story line is incredibly well-written and engaging. But there's one particular aspect of SWTOR that just seems to keep getting under my skin. A recently played story mission for the bounty hunter (mild spoilers ahoy) tasked me with destroying a target's weapon factory to draw them out of hiding. Cue myself, as a Rattataki hunter, blasting my way through the factory's security forces with gouts of flame and dozens of well-placed rockets, stepping over the bodies of the fallen with nary a second glance as I place remote charges on power generators and computer terminals. However, as soon as the last of my charges is placed on the main computer, an in-game conversationkicks in and I'm faced with my big moral dilemma of the day. Some idiot enforcer disabled the "Run like hell, we're under attack" alarm, so all these civilian techies and engineers are still working their posts, oblivious to the fact I just murdered my way through their rent-a-cop buddies. Now a scientist is pleading with me to give him just a few minutes to help get all the non-combatants get clear of blast zone. So, in true Sith form, I could say "Too bad," kill the scientist and watch the whole place burn, innocents and all, from a comfortable and safe distance. Or I could hold off on blowing the place sky-high for a few minutes while the scientist organizes a quick evacuation before things start getting rather explosive. Invested as I am in the story, I decided that well, I'm really only on this planet to kill my target. I'm only blowing up one of his facilities to get his attention, and I doubt he really cares enough about his underlings that he'll get angrier with me for slaughtering the janitors as well.So I pick the honorable path, give the scientist his five minutes, then like all cool guys, don't look at the explosion as I walk away. Not that I can, though, as I really only hear things go boom when I leave that in-game instance, but I digress. 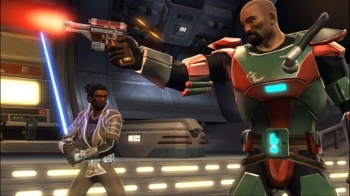 This mission is one of the examples of the morality system in play throughout SWTOR. Most of my quests, like my mission to destroy the factory, have pretty straightforward objectives, but how they differ from your standard MMO fare of killing 10 space walruses or collecting five bear pelts is you often have to decide how evil or good you want to be within the context of the quest, and this affects what kind of rewards you'll have available to you. Kill a bunch of rogue soldiers who murdered a man's family and you're then asked to either encourage him to continue his quest for revenge against the soldiers' families, or take peace that the killers have been brought to justice. Follow the "evil" path to execute an Imperial officer's wife because she had a one-time affair and then frame her as a traitor, or tell her to get off planet because her husband's a nut bag in the "good" option. Moral quandaries are thrown at you left and right and it's an interesting game mechanic to experience in an MMO, especially since it ties into the lore of the Star Wars universe itself.